Getting caught in a car accident is one of the biggest fears of most drivers. Apart from the trauma of the accident, you also have to deal w7ith the seemingly endless paperwork. And the absolute biggest nightmare? Being put under blame for something that just wasn’t your fault or being forced to pay up for damages you didn’t cause. How do you avoid that? The solution is a very simple but effective installation of a dash cam. A dashboard camera can obviously not help you avoid crashes, but will most certainly come in handy and save you money when trying to prove a fraudulent case where the fault isn’t yours. 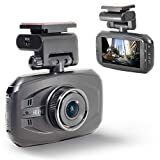 Dash Cams have a lot going on for them and our reviews of some of the best dash cams will certainly help you choose the ideal camera, aligning with both your needs and budget. The V1 is very tiny, unique dash cam. 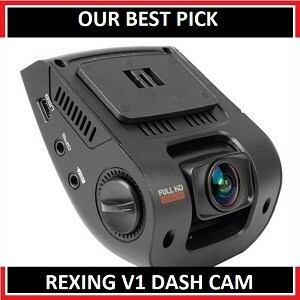 Rexing is quite a popular and established a brand when it comes to dash cameras, and does a pretty good job each time. The V1 one is a budget-oriented dash camera from the company that offers up several reasons to be loved. 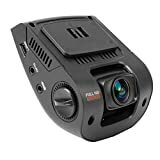 Upon a closer look, the most obvious aspect to this dash cam is its unique design, making it quite different from other available dash cams, and that is the thing that makes it special. Full HD 1080p recording at 30 frames per second. Loop recording in 3, 5 or 10 minutes interval. Comes with a gravity sensor for auto accident/crash/collision detection. Supports up to 128 GB of external storage. Comes with the powerful Sony IMX323 image sensor. When comparing it to the pretty popular Falcon Zero touch pro, the Rexing V1 stands out in terms of features such as external storage addition and the number of lenses, but if you’re comparing in terms of design and style, the Falcon beats out the Rexing V1. This is not to say that the Rexing V1 is boring. Far from it, in fact. Right from the very first glimpse, we were pretty blown away by its unique design. Add to that the specifications that come with it and you’ve got a solid and well-rounded dash came to work with. 170-degree, 6 layer lens with wide dynamic range technology helps to capture Full HD 1080p videos, resulting in super detailed and crisp image. This makes it super easy for you to read license plates, a company name on a roadside banner or a sign on a car, which can be pretty useful in the event of an accident should you need to evidence to prove your case. For those wondering about a loop recording feature, then yes, we can confirm that the camera does support this feature. Loop recording not only lets you record videos in a timeframe of 3, 5 or 10 minutes but you also don’t have to worry about storage issues. As soon the camera starts running low on storage, the advanced loop recording technology automatically starts deleting older unwanted recording to make room for new videos. The Rexing V1 does come with a G-Sensor which helps with the AutoSaving feature by locking videos in the event of an accident/collision. But before you turn it on, make sure you set the sensitivity level to medium in order to avoid unnecessarily triggering the feature at minor road bumps. Low Light Performance: This is one of the most important key features where, unfortunately, most dash cams fail to perform. Luckily, the Rexing V1 does an excellent job here. Irrespective of whether the days are cloudy or it is night time, the video quality comes out exceptionally great in every condition, all thanks to the enhanced night vision technology packed onto the camera. The one and only thing that we don’t quite love about the camera is the LCD display that comes with it. First off, it’s pretty small. The standard display size for most dash cams is 2.7 inches, whereas the Rexing V1 only has a 2.4-inch display. Also, the viewing angles are not the best. Side angle viewing is pretty much non-existent with a clear view only from a head-on angle. Equipped with G-Sensor and Loop recording technology. 1080p FHD resolution @ 30 frames per second. Up to 128 GB expandable storage. 170-degree ultra-wide angle with WDR. Small display with average viewing angles. With the built-in 1080p Full HD display, the Rexing V1 dash cam records crystal clear videos from the windscreen. Its discrete design is pretty unique and a complementary factor for users. You’d be hard-pressed to find similar designs from other manufacturers. The best thing about it, of course, is its price. We would recommend this dash cam to anyone looking to get one without breaking the bank. Having a dash cam installed is a great safety measure to think about when it comes to car insurance. In the event of an accident, you have readily available video evidence should you ever need it. Easy and hassle-free. The KD Links X1 is automatically powered as soon the ignition is turned on. Now, for people who have a tendency to forgot things (don’t we all? ), this automatic power function is a pretty neat feature to have. The KD links X1 camera records videos at 30 frames per second with a resolution of up to 1920 x 1080p, giving you a clear and detailed video. The videos recorded are sharp and are easy to monitor directly through the 2.7″ inch display that comes with the dash cam. No need to plug into a Laptop or PC. Slim design with large 2.7 inch display. Supreme Quality GPS technology manufactured in Japan. Professional Video playing application for both Windows and Mac users with advanced features. Li-Polymer 3.7V 110mah battery that can bear high and low temperature. Full HD 1080p video recording at 30 frames per second. The camera uses 6 glass F1.6 lenses which are commonly used by high-end manufacturers making it tough competition for other ruling manufacturers. The camera in itself is designed very well and looks like most point and shoot cameras. Plastic is the major build component with some chrome on the top and bottom. KD Links X1 comes equipped with G sensors which, again, immediately saves videos on the off chance your car meets with a crash and/or accident – a very important feature to have in case someone tries to tamper with the records. This also prevents important videos from being deleted automatically when storage is low. The X1 dash cam also has the loop recording feature, which means you can record your videos at intervals of 2, 3, and 5 minutes, that later makes it easy for you to navigate through videos. Loop recording also means that older, useless videos will be automatically deleted once the storage is full, making room for new videos. The video quality is absolutely stunning both in daylight and night. You can easily zoom in to the minute details on videos and attain detailed information. If you are looking for a camera that can record audio alongside a video, then the KD Link X1 is the best option for you. It is a good contender to the previously reviewed Rexing V1 in most aspects and comparatively has an easier installation process. The only thing that might bother some users is that the GPS does not indicate accurate time on the videos. Even if you set up the time and date settings properly, it tends to reset it to January 1st the next day. So, if date and time is an important detail for you, you’re probably better off looking at other options. Excellent GPS and Gravity sensor technology. Dedicated video playing application for Windows and Mac, build by the company itself. Maximum storage up to 128 GB. 360-degree revolving camera for rear view recording. FHD 1080p recording @ 30fps. GPS does not set the time and date in the video. The dash cam supports up to 128 GB storage and the installation process is super easy, with an excellent, dedicated support team waiting to help you out should you encounter any issues. The video quality is good, the design is excellent and the 165-degree wide angle is quite capable to capture all 3 lanes in a single frame. Coming in next, from an industry favorite brand is the WheelWitness pro HD. It comes in with super HD 1296P resolution which is the same as the Z-Edge car dash camera and is super easy to install. The 1296P is an upgrade on almost every other dash cam that usually come with a 1080p resolution. With the WheelWitness pro, the manufacturers have gone an extra mile with the inclusion of the 1296P resolution, which although may not be a very big upgrade, but is pretty useful on a dash cam. 2306x1296P resolution (Highest currently for any dash cam). 3.0 inch LCD display for easy preview. Wide dynamic range technology for better night vision. 170-degree extra wide angle lens. Autonomic and continuous loop recording. Save and lock feature for collisions and crashes. We were delighted to see that this camera pushes aside the traditional Novatek processor in favor of the more powerful and advanced Ambarella A7 processor, which results in effortless motion capturing and smooth video recording. The higher 1296 resolution is absolutely amazing. The videos recorded are very clear and the camera captures minute details very well. The dash cam also comes with an inbuilt microphone that records audio along with the video and it is quite good in quality. Remember, however, that high-resolution recording means faster storage drainage. So, if you are going to record higher resolution videos, make sure you get a 64 or 128 GB external SD card. The 3.0 inch LCD makes it easy to preview videos, but, in case you want to view it on a bigger screen, you have the option to hook it up to your laptop with the USB cable that comes in the package. Like other popular dash cams, the WheelWitness Pro comes with loop recording, so you don’t have to worry about storage. The old videos are automatically deleted once the storage is full. However, if you don’t want a specific video to be deleted automatically, then you can put a lock on it with a simple touch. The 170-degree lens Packed with WDR Technology helps in capturing wide-angle videos along with the ability to control exposure, and compensate light and dark spots during one shot in the frame. The wide angle means regardless of where you mount the camera, it will still cover everything that you’re seeing through the windshield from left to right and vice versa. The G-sensor comes integrated into the dashboard camera to automatically lock and save videos after any collision. 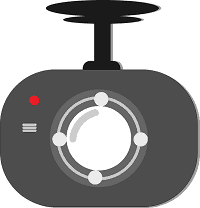 The camera also comes with the option to add GPS module, which would add date, time and location to your videos. The instruction manual that comes in the package is amiss on a lot of information about the functionality of this dash cam. We’d advise manually going through the different setting and features available to give you a sense of what is possible with the camera. The dash cam comes with a 450 mAh lithium battery which is pretty great when looking at what other dash cams have to offer. This isn’t all that important, however, since the dashcam is only powered on when the ignition is on too and can be powered directly through the charger that comes with it. 2304x1296p HD resolution for high-quality videos. Records videos at 30 frames per second. Motion detector WDR and Night Capture. The instruction manual is slightly confusing and misses a lot of the information. Along with the other features, the GPS works great on this dash cam as well. The display is of a higher resolution and an upgrade when compared to a regular HD display. The best thing about the camera though is the 170-degree extra angle coverage and exceptional Night vision technology. 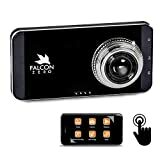 Falcon is a renowned brand when it’s coming to designing dash cams, and the 4″ Zero Touch Pro from them is undoubtedly fantastic. The Zero Touch Pro covers all the technical features of the other dash cameras available in the market, and in addition, comes with a 4″ touchscreen display (Generally, a dash cam comes with a 2.7″ or a 3” standard non-touch screen display). The overall design is very similar to that of a standard mobile phone, making it very compact to hold while monitoring videos. Comes with 2 docking stations for multi-vehicle use. 4-inch touchscreen for easy navigation. Comes with Intelli-Batt battery drain technology. Gravity sensor for auto save during crashes and collisions. Up to 64 GB expandable SD Card storage. 3.0 MP CMOS sensor with superior 6 elements aspherical glass lens. The 4-inch screen is a 1080p HD display with great colors and picture quality. You don’t really need to hook up the camera to a laptop. With the larger 4” screen, you can clearly see minute details like numbers in a license plate, registration number of a car or a sign name on the road. The camera is also packed with the 170-degree aspherical glass lens and 3.0MP CMOS sensor that can capture up to 30 frames per second. It’s important to note that 170-degree is the widest angle that any dash cam can offer and you do get that with the Zero Touch Pro. The Zero HD dash cam comes with the G-sensor that helps instantly lock and/or save videos into storage when triggered during a crash or accident storage, ignoring the loop recording setting you have in place. The storage is the most important part of any car camera, and the company has added plenty of storage option on this one. You can add up to 64 GB of memory via an SD card which should be more than enough even for an extended long trip. Furthermore, with the Loop recording technology that comes with it, you are not going to face any storage problem even with an SD card of lower capacity. With 2 docking stations in the package, it becomes easy to use the dash cam in multiple vehicles. For convenience, you can set up one of the docking stations in your main car and the other in any other car you may have that is perhaps not used as regularly. And just like that, you are good to switch the dash camera easily between both cars. If your previous car camera didn’t perform well in low lighting conditions or during night time, then the Falcon Touch Pro will come as a major upgrade. Preloaded with HD night vision feature/WDR, the camera records exceptionally clear videos even during night time or in low lightning weather conditions. 4″ Touch Screen Display with 1080p video recording. Includes option to use SD card up to 64 GB. Comes with Loop recording technology. Comes with 170-degree WDR and Anti-Drain technology. None of the dash cams in the market offer a 4″ touch display on top of so many excellent features. This camera would come highly recommended by us if you’re on the look-out for a new dash cam. The dash cam most certainly offers you a great set of specifications, bundled into a sleek overall design. The Rexing S300 tends to get left behind when pit against other competitors but a few excellent features make it a decent contender on this list. The Rexing S300 can record video at a resolution of up to 1920x1080p at 30 frames per second, giving you clear and superior video, and image quality. The display of this dash cam is a standard 2.7 inch display, which is similar to most cameras by other competitors. 2.7-inch screen with a sleek overall design. Superior night vision image sensor by f2.4 six glass lens. Accident auto detection by G-sensor and loop recording. The wide dynamic range for low lighting scenarios. Supports external storage up to 128 GB. Rexing is quite similar to other cameras that record FHD 1080p videos at 30 frames per second. It has a large screen but a sleek design that helps you in keeping your camera discreet. The camera comes with Loop Recording and a G-sensor. The G sensor automatically saves and locks the video whenever your car is in a crash or collision. Loop recording, on the other hand, loops over and replaces old files with new files, ensuring that your dash cam doesn’t run out of storage. The camera is ready to use right out of the box without any setup needed. Along with the dash camera, you get a mounting pad that allows you to easily mount the camera onto your dashboard, behind the windshield. The camera also features a high-quality battery that can stand extreme temperatures of -42-degree to 170-degree Fahrenheit. 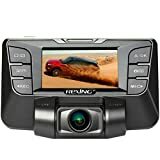 The Rexing S300 is one of the most unique dash cameras that features a rotating camera, which means the lens can be fully rotated to be used as a rear dash cam, depending upon user preference. The customer service from Rexing is awesome as always. We talked about it when discussing the V1 and we mention it again. If you’ve ever faced bad customer experience then the Rexing support service will be a true delight with absolutely no issues at all. One slight drawback is that the camera doesn’t come with a USB file transfer feature, meaning that every time you need to transfer videos from your dash cam to your laptop/desktop, you’ll need to pull out the SD card and plug it onto your PC. This can get a little frustrating for someone who is in habit of checking through the videos regularly. Superior night vision image sensors. Slim and lightweight ergonomic design with easy to operate buttons. Unique WDR system which record videos with extra highlighting. Supports up to 128 GB of storage. No USB file transfer option. The Rexing S300 comes with practically any and all features that a decent dash cam should have. It got sports certain unique features such as a rotating camera, enhanced night vision and a very sleek design. Though the USB file transfer is amiss, this shouldn’t be a major issue for most users. ITrue X3 is one of the most beautiful car cameras that you can find. Adding to its sleek design are the excellent features that come with it. The dash cam comes with endless loop recording which pretty much means you don’t ever have to manually go through it to delete older outdated recordings, until and unless it is an older locked file. While most cameras do come with the loop record feature, there are a few that don’t and we would suggest steering clear of those options. It is a complete waste of time going through the storage every now and then in order to make room for future video recordings and then going back and redoing the whole process. 1080p video recording at 30 frames per second. 6 layer glass lens provides great picture quality both at day and night. Unique and Beautiful leather stitched design. Emergency lock button and G-sensor for auto-detecting collisions. 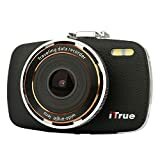 The ITrue X3 comes with excellent night vision, 170-degree 6 layers lens glasses and can records Full HD 1080p videos at the rate of 30 frames per second. Though the design looks similar to other dash cams, what we love most is the stitched leather design of the camera. The camera has a unique front surface with a leather covering on top that provides excellent grip and feels great in hand. The design and feel are what makes it different from its competitors, despite the fact that it has features similar to them. The videos recorded at 1080p are bright and clear and come with great audio sound and quality. The suction mount that comes in the package is excellent in terms of quality, plus is very easy to move from one vehicle to another. The storage capacity is slightly low with a maximum support of 32 GB external storage. Like other top dash cams, ITrue X3 also supports auto start in sync with the vehicle ignition, meaning the camera turns on as soon as the ignition is turned on. The dash cam also supports G-sensors that autosaves the video in the event of a car crash or collision. The camera doesn’t have any major drawbacks apart from the storage capacity. In our opinion, a dash cam should at least support 64 GB of external storage. With the inclusion of loop recording, however, this shouldn’t be too much of an issue. Although this does mean that the maximum number of recording that the camera can hold at any given time will be limited in comparison to other dash cams. Unique stimulated stitched leather style. Emergency lock button along with crash detection. 1080p FHD recording at 30 frames per second. Low maximum storage support of up to 32 GB. The ITrue dash cam is classy and does add a stylish element to the interior of your car. You are sure to get a few appreciative comments from friends! The camera is small, lightweight, easy to install and supports continuous loop recording. 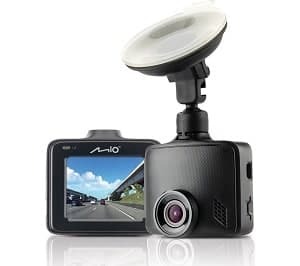 Apart from these, it comes with all other major features that a dash cam should have, all at a pretty exceptional price tag, making it pretty hard to resist. With built-in Advanced Driver Assistance System and an ultra-low price tag, the Yi Dash camera is the most value for money option in this countdown. Although initially, the overall design of the camera can be a little confusing – it is designed in the shape of a handy cam and is very small and very compact – but when it comes to performing the job it was made for, the camera certainly proves exceptional. The Yi dash cam comes packed with a high-end processor and a 165-degree wide angle lens with F1.8 apertures and 3x3mm high image sensitivity sensors that can record videos up to 1080p resolution at a maximum frame rate of 60 frames per second. This is all surprisingly impressive, especially when considering the price that you pay for it. Comes with the Advance driver assistance system (more info below). 165-degree wide angle for full 3 lane coverage. 2.7 inch TFT LCD screen. G-sensor and Loop recording enabled. 6G all glass lens with an infrared filter. The dash cam comes with G sensors which automatically stops and saves the current recording when triggered by crashes or collisions. The Xiaomi Yi dash cam comes with a 2.7 inch TFT screen which is decent enough to monitor and go through videos. Other great functionalities include the portable storage option which supports up to 64 GB of external SD card and goes as low as 8 GB (sold separately). One-touch sharing: The Xiaomi Yi dash cam comes with 2.4 GHz wireless module, through which you can create a wireless connection between your mobile phone and the dash cam (with a dedicated Xiaomi mobile app), and then view live video footage or play existing video recordings. You can also share footage with your mobile device over Wi-Fi which is a pretty nifty feature, saving you the hassle of manually extracting it from the SD card by removing and inserting it onto a laptop. ADAS (Advanced Driver Assistance System) – the Yi comes with an advanced and optimized technology called ADAS. Basically, this is a visual recognition algorithm that ensures safe driving by real-time lane departure. The video quality that Xiaomi provides on this dash camera is simply amazing. Though it provides the same 1080p FHD video quality that most other cameras come with, what sets it apart is the 60 frames per second rate where usually most cameras offer a rate of up to 30 frames per second. The company has done a pretty good job, working to reduce blind spots with the use of 165-degree ultra-wide angles, which can cover even broad 3 lane roads. Some other basic features include the G-sensor and Loop recording option. G-sensor auto-detects any crashes and collisions and instantly saves and locks the current video. Loop recording on the other hand, records videos in the smaller time frames of 3 minutes and loops over, replacing useless old files ensuring the camera doesn’t run out of storage. USB port can only be used for charging and not for file transfer or looking up recordings, which isn’t a major issue with the built-in wireless option but it can get a little cumbersome to constantly connect each time you want to pull up a certain recording. The silvery grey color is pretty prominent and quite visible from outside and doesn’t blend in with most dashboards. A black variance would have been quite appreciated and should have been an option by the manufacturers. The Advanced Driver Assistance system. Records at 1080p at 60 frames per second, which is the highest among all. 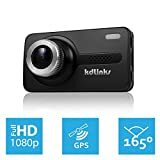 Extremely low price point as compared to any other dash camera. Some menu features are hard to understand. No file transfer via USB port. Xiaomi is a pretty well-known brand and is renowned for delivering quality products at a fairly low price point when compared to competitors. It is pretty obvious that the features of this dash cam outweigh the price. Our official recommendation would be that this is a great dash cam and you should confidentially head out and buy it! Packed with an ultra-high-resolution display, and exceptionally great features like WDR, and Loop Recording, this dash cam has been voted as the best dash cam of 2016 by The Wirecutter. Most popular dash cams in the market come loaded with Novatek chipsets, but that is not the case here. The Z-Edge features the Ambarella A7 Processor resulting in smooth and stable recordings with faster processing speeds (Similar to the processing on the WheelWitness Pro). 150-degree wide angle for better coverage. 2560x1080p Super HD video recording at 30 frames per second. 3.0inch scratch resistant LCD screen. Automatically save and lock at crashes with built-in G-sensor. Supports up to 64 GB of external storage. Six-glass lens and a highly sensitive image sensor. 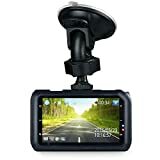 The high-quality camera is capable of producing videos of resolution up to 2560x1080p recordings at a frame rate of 30 frames per second, which is one of the highest resolutions on any dash cam. The recording is of great quality and you can easily zoom into minute details. If you’ve been using an older dash cam that doesn’t support 2k recording, you’ll notice a drastic difference in video quality. Like almost every other dash cam, the Z-Edge also comes with a loop recording feature that loops back and overwrites older video footage with newer recordings, ensuring you never run out of storage space. The loop recording also breaks up videos in segments 1, 3, and 5 minutes making it easier to search for specific time ranges. The device also comes with the ignition detector feature that automatically powers the camera on as soon as you turn the ignition on. This can be very helpful since some of us do have a tendency of forgetting stuff. It would be pretty frustrating to get into an accident and then realize you never even switched your dash cam on, rendering it pretty useless. Packed with a G-sensor, the dash cam automatically stops when you stop your car for a period of time and starts back up automatically when you start moving. 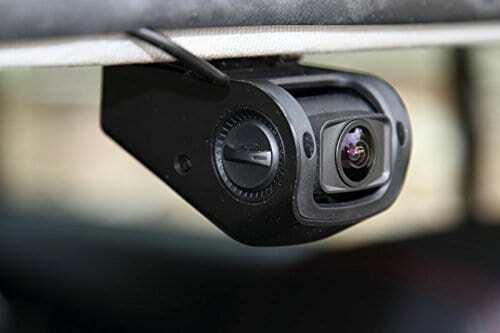 The G-sensors on the dash cam also works to save your current video by locking it in the event of a crash or collision. Two things come to mind when talking about the negatives – audio quality and set up. The microphone volume isn’t very high and the videos tend to exude a high pitch whine when played out loud. Set up on the dash cam isn’t the easiest and can take up a bit of time. Motion and Crash Sensors for intelligent recording and locking. Broad 145-degree field of View. Setup can be a bit time consuming and complicated. This is a power packed dash cam with some pretty excellent features and really great video resolution. Features like motion play and pause set this camera apart from fellow competitors on this list. The processor used is super powerful and ensure that you do not face any lagging issues while using it. Smart, powerful and cheap – these words perfectly describe the next dash cam on our list. The Taotronics car camera comes with virtually every feature needed in a good dash cam, all at a very reasonable price. You get excellent clarity from the 150-degree, 6 layers lens glass that also supports WDR technology. In terms of processor, the Taotronics Dash cam still relies on the older Novatek processor, where we already have a few options in the market that have upgraded to the Ambarella processors. 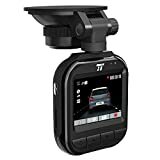 Although this is to be expected at the price point, the addition of the Ambarella processor would have given a serious boost to the overall performance of this dash cam. Power on/off with car ignition. Loop recording and G-sensor enabled. 1080p Full HD video capture at 30 frames per second. 150-degree wide angle with 6 layer glass lens. The dash cam comes with the option to support an SD card of up to 32 GB SD card, which might seem on the lower side, but with the loop recording feature that automatically overwrites older useless recording, this storage shouldn’t be an issue for most people. The camera comes with a 150-degree wide angle lens that records videos up to 1080p at a maximum rate of 30 frames per second. The videos recorded are amazing with excellent clarity, and on par with most other 1080p dash cams. Other general features include G-sensors for auto saving videos when triggered by accidents and/or collisions, and a button to instantly mute and lock videos. The camera also comes with the auto power option in sync with your ignition. Just turn on your ignition and the dash cam will start recording immediately. You have the option to delay the auto start by 10, 20 or 30 seconds. With the loop recording feature on the camera, you get the option of choosing between 2, 3, or 5-minute length videos, making it easy for the user to go through videos later. All new videos have a 1 second of video overlap from previous videos. Loop recording also makes sure your camera never runs out of storage by rewriting old, useless files once the storage is full. Overall the camera records excellent and sharp footage and is super easy to mount and install. Basically, there is a very minimal learning curve and you should be able to use it like a pro from the very first day. The price tag is very cost effective and is probably one of the cheapest on the market. There are no issues with build quality as well. The nighttime visual isn’t the best and we’d probably call it average. It tends to come out a little dark and can be a little hard to see, although far from impossible to view. Menu buttons are not the best to use. Looking at the price at which the camera is available, however, it is an acceptable flaw. Maximum expandable storage is on the low side. Loaded with superior night vision technology. Excellent Mobile design-build with quality material. Night vision or low light lacks perfection. Menu keys are of average quality. Storage can be extended to 32 GB only. Since the dash cam is small, it is very easy to mount onto dashboards without taking away from the windscreen view. The wide angle lens captures a full view in both daylight and night time conditions. Like other dash cams, it also includes G-Sensors to auto stop and save the current video recording in case of a collision or crash. Disregarding the slightly low night time performance, this camera is an ideal choice for most users, especially considering the great price point. Sleek in design and compact in shape, this dash cam is one of the smallest dash cameras available in the market. The camera comes packed with a 6 layer Nikon glass lens capable of capturing 1080p full HD footage. The Lumina Zoom Series dash cam also features the G-sensor which automatically saves and locks the video on crashes and collisions. One of the smallest and low-profile dash cams in the market. FHD 1080p video recording with H.264 photography compression technology. Built-in G-sensor for auto video lock after accidents. 6 Layer Nikon glass lens with 170-degree wide angle. A wide dynamic range for vibrant recordings at night. The camera makes it very convenient to cover a 3 lane road with its 170-degree ultra-wide angle lens, which is the standard size for most of the popular car cameras. The dash cam comes with a Nikon lens and Sony CMOS sensor that records high-quality 1080p videos at 30 frames per second. It also has a wide dynamic range for enhanced night vision. The Sony sensors come highly acclaimed and certainly prove their hype on this dash cam. As with other dash cams on this list, the Lumina dash cam also comes with Loop recording, ensuring that you always have an interruption-free recording. As mentioned, the camera also includes a G-sensor that autosaves the recording video and locks it should your car crash or meet with an accident/collision. The manufacturers recommend a class 10 SD card for better performance but a regular SD card with comparatively lower speed will work fine as well. Talking about the storage capacity of the device, it supports up to 32 GB SD card (not included in the package). Nikon lens combined with a Sony CMOS sensor. G-Sensors for auto-saving of videos. Only 32 GB of maximum expandable storage. The Lumina dash cam is one of the smallest dash cams in the market. It blends well with the dashboard and is hardly noticeable from the outside. In terms of functionalities, it has everything you will ever need in a dash cam. Before we move on to the buyer’s guide, let’s have a look at the reasons why you should get a dash cam ASAP. Should you find yourself in a car crash, a dashboard camera helps in providing video evidence of the incident. You are free from worrying about false claims from other people involved in the accident. If you find yourself being put under blame for something that wasn’t your fault, you now have proof to back you up and help clear your name. There have been several incidences where people were able to clear their name with the help of footage from their dash cams, without which they most certainly would have been in trouble for something that wasn’t their fault. Most small-scale incidents occur while parking. This comes as no surprise then, that reverse cameras are a very popular purchase since they help ease in and out of tight spaces without causing accidental damages. But what happens when someone does accidentally bump into your parked car when you are not around? What if they decide to make a run for it? Having a dash cam installed might be a smart idea then. Most dash cams come with a car park feature that functions while the car is parked. Simply leave it on and it will continue to record, providing evidence that can help in identifying the owner of the car by way of the number and license plate. How many times have we been asked to borrow our car for quick drives or in cases of emergencies? Friends and family can have the best of intentions while borrowing our cars but their driving may not be the greatest. Having a dash cam installed removes any and all questions you may have and gives you a peace of mind knowing you can always go back and watch how they’ve treated your car. Have you ever come across the very strange situation where someone bumps into you on purpose, solely to claim insurance? Consider yourself lucky if you haven’t since this is a pretty common occurrence in some countries. In such a situation, you can save yourself and the insurance companies the headache of an insurance fraud case. A dash came can provide evidence in such a case. The display screen is a key aspect of these cameras. In the event of an accident or car crash, you may or may not have easy or quick access to a computer or laptop, essentially forcing you to monitor the footage right on the camera. This makes the display screen pretty important. So, what size is ideal? The most common display size is 2.7 inches, with a “few” dash cams coming in at 4 inches. There are of course variants with 2.4 or 3 inches. Ideally, it would be the bigger the better but if your camera offers on-screen zoom, you’re good with basically any size. Contrary to other gadgets and cameras, dash cams don’t necessarily need to have the biggest or the best. Most dash cam batteries last up to an hour at continuous shooting, which is to be expected. The easy fix to this is just hooking your camera up to your car’s power supply. This was you don’t really need to fret about battery levels or charging your camera. While most dash cams come with this feature, there are still a few that don’t. If you ask us, loop recording is a pretty important feature. Since most cameras record full HD 1080p videos that are very large in size, you are bound to run out of storage space quickly. With loop recording, however, this isn’t an issue. The advance mechanism will automatically delete older useless videos, making room for new ones. As mentioned during the review of the dash cams, a few of them come with the feature of auto start on ignition. This can be almost as important as the Loop Recording feature for some people. Most of us have a tendency to forget things, especially if we’re in a hurry. Imagine forgetting to actually turn on your dash cam before driving and ending up in an accident that you now have no video proof of? Yeah, not the smartest thing to do. That’s where the Auto Recording feature comes in and ensure the dash cam is always on as long as the ignition is too. This mode is very helpful as it keeps the camera turned on while the car is parked. Say you return to your car only to find a dent caused by a reckless hit by a hit and run, or by someone learning to drive, the camera will pick up on this and provide evidence as to who the culprit is. For Parking Mode usage, you’ll need to keep the dash cam powered using you the cable provided. These can hook up directly to your car making power issues non-existent. G-sensors are pretty important in case of collisions, as once triggered, they simply stop the video, lock it and prevent auto-deletion. 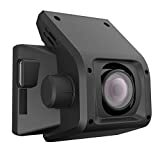 All of the dash cams claim that they come with superior low lightening technology, but to make sure of that do check the pictures posted by the customer over different online sites. There are basically two types of mounting methods, one using a suction cup and the other using adhesive. The suction cup is easy to transfer from one car to other, while the adhesive mount is permanent (although the camera is transferrable). If you’ve decided to buy a dash cam then you already know the importance of having one installed. They are pretty useful when it comes to accidents and insurance claims. If you’re looking to get your first dash cam, we’d suggest not going for the pricy high-end ones just yet. Any camera under a 100 bucks should work pretty well and suit most basic needs. If eventually, you feel you’d benefit from the expansive features that higher-end cameras come with, then, by all means, splurge away.